If Dante Fowler ends up being one-and-done with the Rams, Allen would be a suitable replacement. Allen is strong enough to set the edge against the run, and does just enough as a pass rusher to warrant first-round consideration. Super Bowl stinker aside, this offense is outstanding, and the addition of a matchup piece like Smith would just give Jared Goff and Sean McVay one more weapon. He has speed and athleticism. But there are also a lot of holes on defense, so the Rams might look to add to the secondary. There are a ton of dynamic receiving backs in the NFC. Christian McCaffrey, Alvin Kamara, Saquon Barkley, Tarik Cohen, Zeke Elliott… the list goes on. While Cory Littleton had some success in coverage, his running mates leave much to be desired on the second level. The group needs an overhaul and Wilson projects perfectly to playing off the ball against today’s NFL offenses. Wilson thrives in space, featuring impressive fluidity and speed. His coverage awareness is strong and he can matchup with with backs and tight ends in man coverage. Wilson offers three-down upside in the middle of Wade Phillips’ defense. I kind of like the fit of Michigan LB Devin Bush because the Rams’ linebacking corps had issues clamping down on RBs and TEs in the passing game this season and he’d be a nice start in addressing that issue. But the Rams could also use edge help and I think if Sweat fell this far the Rams would figure the universe is telling them something. The Rams have to invest in the future of their offensive line despite having 2018 draft picks Joseph Noteboom and Brian Allen waiting in the wings. Ford could be a replacement for Rodger Saffold if he leaves in free agency, then ultimately play one of the tackle positions after Andrew Whitworth retires. He told us during Senior Bowl week that he was “a bigger version of Chandler Jones.” It sounds preposterous until you see him play. He can set the edge win the rushing game, routinely collapses the pocket, and shows the motor to regularly be disruptive in the passing game. And with Ndamukong Suh’s future uncertain, Omenihu would contribute immediately. The Rams could easily end up trading this for a veteran instead, because that’s what they do. But it wouldn’t be surprising to see them grab a pass-rusher given the likely departures of Dante Fowler and Ndamukong Suh. The Rams’ second level defensively could use some thump and Wilson certainly brings that. He registered 21 pressures on 67 pass-rushing snaps last year. What does the future hold for the Los Angeles Rams defense? There are major questions with free agency coming up for Dante Fowler Jr. and Ndamukong Suh on the defensive line. Les Snead and Sean McVay need another great offseason after loading up for a Super Bowl run through high-priced trades and free agency. Jaylon Ferguson, aka Sack Daddy, is a natural replacement for Fowler as a defensive end who can play standing up or with his hand down. His production in college—45 sacks—shows that he’s ready to play, and his week at the Senior Bowl showed he’s good enough to produce against NFL-caliber blockers. Unless they opt to take a discount to remain in town to get another chance at the Lombardi Trophy, the Rams could be facing a mass exodus along the defensive line with Ndamukong Suh, Dante Fowler, Dominique Easley and Ethan Westbrooks all scheduled free agents. As such, don’t be surprised if GM Les Snead takes the best available defensive lineman remaining at this spot. Massive, powerful and athletic, Tillery is a top 20 talent who could be a steal at this point in the draft. 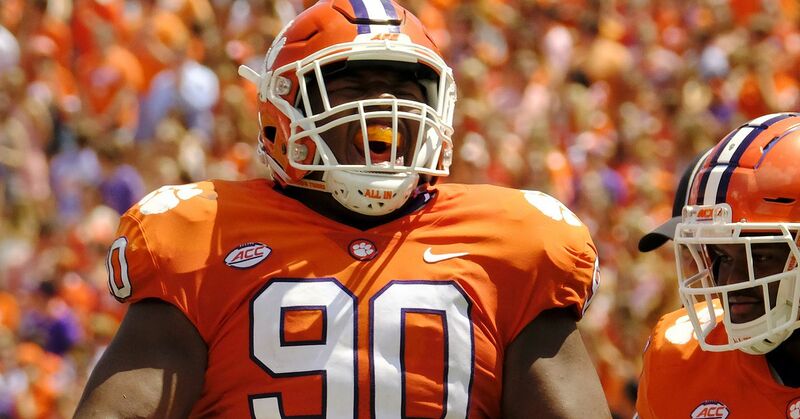 At 6 feet 4 and 340 pounds, Lawrence could be the draft’s best true nose tackle prospect. That might work out perfectly for the Rams, who could let Ndamukong Suh walk without having to worry much about overburdening superstar Aaron Donald inside. Lawrence never developed into the upper-tier prospect many foresaw, and his recent failed test for performance-enhancing drugs is a red flag. But he has great value as a run defender and some promise as an interior pass rusher. Rams trade down to the 37th spot in exchange for “an early pick in next year’s draft” from the New York Giants. The Rams could lose LaMarcus Joyner in free agency. Adderley is listed as a free safety, but has spent significant time at cornerback. He makes plays regardless of where he lines up. I’m going back to Dre’Mont Jones as my horse of choice in 2019 in this week’s SIM. Jones registered 43 tackles, 13 for a loss, 8.5 QB sacks, one forced fumble, and one INT during his Junior year with the Buckeyes before declaring for the NFL Draft. The Rams would slide Jones into Ndamukong Suh’s spot, who could be a cap casualty. Rams’ GM Les Snead is staring at a list of 22 free agents on the current roster, led by Suh and newly-acquired EDGE rusher Dante Fowler, Jr. The Rams have a little more hope with edge pass-rushing at the second level with Dante Fowler Jr., but they could use someone who can clean up well against the run behind Aaron Donald and Ndamukong Suh and cover better ground against the pass with Cory Littleton going into restricted free agency and Mark Barron hitting his age 30 season. Lamarcus Joyner hasn’t played up to his franchise tag status, so Los Angeles might be better off letting him walk and plugging in Thompson, an aggressive hitter who can match up with tight ends and slot receivers. It’s often difficult to identify obvious needs for teams that just appeared in the Super Bowl, but that isn’t the case with Los Angeles. There are actually three or four areas that will have to be addressed this offseason, but the defensive front seven may be the most glaring. Ndamukong Suh is a free agent after only signing a one-year deal and with so much high-priced talent to pay the Rams will have to make some tough decisions. Even if Suh returns the run defense still ranked in the bottom third of the league and there is little or no depth on the interior. There may not be a more freakish blend of size, strength and athleticism in this class than Lawrence, who at one time was being talked about as a potential #1 overall pick. An immovable object in the middle, Lawrence excels at eating gaps, stuffing the run and occupying multiple blockers. Lawrence isn’t a dynamic pass rusher but uses an outstanding combination of quickness and power to disrupt in the backfield and make plays up front. 13 of the 18 experts predict the Rams will use the 31st overall pick to shore up a front seven that has many question marks heading into the offseason — and it’s easy to see why. With Suh, Fowler, Westbrooks, Easley and Littleton all set to test free agency, addressing how to fill those potential vacancies will become a priority for the Rams in the early stages of the offseason. Assuming the Rams are somehow able to make the numbers work and retain some of those guys, a healthy portion of the remaining experts feel like Lamarcus Joyner’s time with the Rams could be coming to a close. There wasn’t much focus on the offensive side of the ball here. Trapasso showed some concern that Saffold – also an unrestricted free agent – might not be back. And McShay appears to be relatively unimpressed with what the Rams have at tight end, though he too sees a potential need in the defensive secondary. Who got it right? And who would you like to see the Rams select (assuming they stay put) on Day 1 of the NFL Draft?